The warning has to be immediately evident. While a detailed paragraph explaining the hazard would offer a more thorough warning, reading all that text would waste valuable time — time people may not have during an emergency. The warning cannot be restricted by language barriers. There’s no guarantee that the people viewing your hazard warning will speak your language, or even that they’ll all speak the same language. Your warning should be designed to protect anyone, no matter which language they speak. These two critical tenets rule out most of our common methods of conveying information en masse, but there’s one very old, very basic communication option remaining that’s both universally understood and immediately accessible: The pictogram. 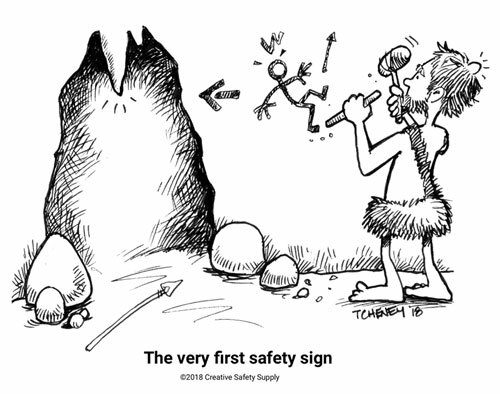 First used by our cave-dwelling ancestors to depict crucial information such as the location of food and which animals are especially mean, pictograms are the perfect vehicle for conveying warnings. They’re simple, easily deployed in any environment, and, when designed correctly, pictograms can be recognized and convey meaning to anyone, of any age, anywhere in the world. 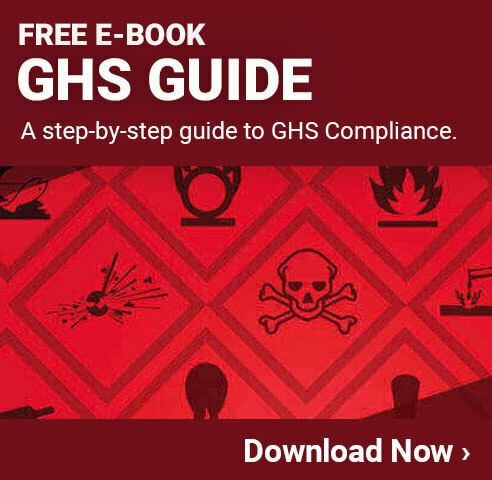 As that’s exactly what you’d want from a warning system designed to keep people informed in life and death situations, OSHA recommends the use of pictograms on every hazard warning. While there are numerous pictograms to be found throughout the modern workplace — particularly if that workplace deals in caustic chemicals — the recently-adopted Globally Harmonized System of Classification and Labeling of Chemicals relies on nine core pictograms which we’ll explore below. Health Hazard: This pictogram indicates a substance that presents a health hazard when inhaled, has high carcinogenicity or mutagenicity, and/or directly damages one or more organs. Flame: The flame pictogram indicates a substance that is flammable. This includes common flammable substances such as gasoline, but also includes liquids and solids that burst into flame when in contact with air and water, and mixtures with the potential to self-heat and spontaneously ignite. Exclamation Point: That exclamation point is designed to get your attention quickly, because it indicates a hazard that is acutely toxic. Acutely toxic substances cause damage quickly, can be absorbed in numerous ways (including respiration and skin contact), and can cause damage to eyes, skin, and internal organs with even minute exposure. Gas Cylinder: This pictogram indicates that gas under pressure. This includes compressed gases, liquified gases, and gases that have been dissolved. Corrosion: Exactly what the name would suggest, this pictogram indicates substances that corrode metal or flesh. Needless to say, these substances can cause serious eye damage. Exploding Bomb: The exploding bomb pictogram commonly indicates explosives, but it also includes substances and mixtures that are self-reactive, which can react explosively to even the most minor of physical shocks, or even a slight increase in air pressure. Flame Over Circle: This pictogram represents gases or liquids that oxidize, or lose electrons. This seems like a minor concern compared to, say, explosives, but the oxidization process can completely transform a substance. Hydrogen gas, for instance, quickly becomes water when oxidized — that’s great news for thirsty people, but bad news for anyone hoping to use that hydrogen for its many industrial purposes. Environmental: As the dead fish suggests, this pictogram indicates that a substance poses a hazard to the aquatic environment, and should not be allowed to reach lakes, streams, or groundwater. This can include both acute hazards which will immediately cause massive damage to the ecosystem, as well as chronic hazards which can destroy an ecosystem for years or decades to come. Skull and Crossbones: The skull and crossbones pictogram serves as a warning against substances that are acutely toxic. These are substances that can cause significant damage with very limited exposure, such as a single dose absorbed orally or through the skin. Effects of acutely toxic substances range from skin lesions, to respiratory difficulties, all the way up to death.